One thing I always have in the freezer is a packet of puff pastry because there are so many quick options for whipping up a snack or meal using it. A favourite in our household are puff pastry pinwheels both sweet and savoury. They can be made with a few simple ingredients or dressed up with some gourmet additions and toppings. Before we get into the toppings, here is the basic recipe for how to make pinwheels. Turn the oven on to preheat to 200C (390F) while assembling the pinwheels. Line a baking tray (or trays) with baking paper and set them aside. Now, get your ingredients ready – puff pastry and toppings. Remove as many as you think will be required from the freezer and allow to thaw for 10-15 minutes (maybe more depending on temperature). Remember, pinwheels are best eaten on the day they are prepared (but can also be eaten the next day) so don’t prepare too many. Put them into the oven and cook for 10-15 minutes, or until nice and golden. Once ready, remove them and allow to cool slightly before serving. Or, if eating later, allow them to cool on a wire rack. Here are a few suggestions for pinwheel topping to get you started. Most are ingredients that are usually on hand and will be quick and easy to use. Puff pastry pinwheels are a great addition to the family recipe file. You can serve them when entertaining, dish them up for a quick snack and even use them in lunchboxes. Have fun, experiment with the toppings and enjoy! Please feel free to leave any topping suggestions below – I’d love to hear them. Also, don’t forget to share with your friends using the buttons below. This is an awesome recipe! Thank you so much for the awesome tips, my meal would have definitely failed if it weren’t for them!!!! After rolling place in freezer for 20 mins or so. Makes the slicing so much easier, like cutting crusty bread! I used some creamed philly (philadelphia) mixed with tomato paste and chopped parsley, salt & pepper to taste, simple & yummy. Does banana go in pinwheels ok? Hi Verity, I must admit, I’ve never tried it! But, I think it would be fine. You could either do slices or try mashing it up and spreading over the pastry. Sprinkle a bit of cinnamon and sugar and it would be nice. I’m going to try this myself Good luck. Why does the cheese not melt out of the pinwheel? Good question Heather! A couple of reasons I think. 1. 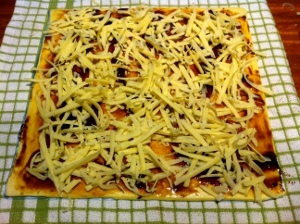 I don’t overload the pinwheels with cheese – as the photo shows, it is sprinkled over but not a thick layer. 2. As the puff pastry expands, the cheese melts into the pastry and other toppings. So basically it acts more like a ‘glue’ and doesn’t usually run out of the pinwheel. Sometimes there might be a small amount on the bottom of the pinwheel, but in my experience it has never been much and it forms a ‘crust’ on the bottom. Banana Nutella are delicious. I spread the nutella over the puff and add sliced banana. I’ve also done peach ones using canned peaches (well drained, of course). First I spread a little butter over the puff (not melted, just like buttering bread only not as much) and sprinkle with brown sugar and cinnamon and then place the peaches on. Once I cut them, I like to brush with a little melted butter and sprinkle more brown sugar over the top. They taste like peach cobbler. And for savoury, I like to do ham, cheese and pineapple with Lego’s pizza spread sauce. YUM! Can I make the pin wheels and freeze them for when I am ready to bake them ?? Hi Zana, if you’ve used frozen puff pastry you can’t refreeze it. However, if you start with fresh pastry that you’ve made, you could certainly try freezing them. Any frozen item, once cooked through, can be refrozen. Must be cooked though! Mmmm, I must admit I’m a bit stumped by this one Helen. Do you have issues with other things cooking unevenly? It could be your oven. Another suggestion is to rotate the pinwheels around during cooking, particularly if there are some that are cooking faster than others. One last thought is that the fillings might be affecting the pastry. If there is too much liquid released, this could hinder the pastry from cooking properly. How would blueberries go or should I add something else to it also? Thanks so much…. I was trying to think of something easy that the grandchildren could help with and enjoy afterwards. I now have quite a few ideas. I also have an abundance of dried fruit to use up so might try mixing it with ???? (Any ideas?) 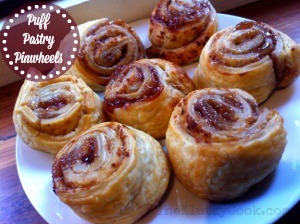 to make yet more tasty lunchbox / easy entertaining pin wheels. Thanks again so much for the inspiration. 1. Brush pastry with butter, sprinkle with cinnamon and sprinkle over chopped sultanas/currants/dates etc. 2. Process the dried fruit in a food processor and make it like a paste…a bit like the fruit mince here. Make sure to mix in a bit of melted butter or something similar so it is not too dry. Once done, spread it onto the puff pastry. 3. If you have dried apricots, spread a thin layer of apricot jam and then sprinkle over diced apricots and coconut. You could also add some chopped nuts. Hello, I would like to make these for a breakfast party. Can I make, bake and freeze and then let them defrost at room temp to serve or do I need to rehear them? Other option would be to make them the day before and leave in a sealed container on the counter?